Karen Hampton. 'Under a Shade Tree,' 2010. Silk organza, linen, pigment dye, and hand-stitching. Courtesy of the artist. Karen Hampton. 'Walk with the Ancestors,' 2014. Linen, pigment, and cotton hand-stitching. Courtesy of the artist. Karen Hampton. 'Harriet Tubman,' 2015. Dye-sublimation print on polyester twill over archival inkjet print on silk organza, and hand-stitching. Courtesy of the artist. Los Angeles-based textile artist Karen Hampton examines the African-American diaspora in an exhibition that explores her personal and ancestral narrative. Karen Hampton: The Journey North, organized by the Ruth and Elmer Wellin Museum of Art at Hamilton College, features new and recent textile works that tie together stories of Hampton’s multicultural heritage, from her family’s colonial past to her present experiences as a person of African, Caribbean, and American descent. The multilayered installation showcases the aesthetic and conceptual richness of Hampton’s textile works, which are interwoven with myriad genealogical references, and serve as a powerful vehicle for instilling the experiences of those who came before her while charting and claiming Hampton’s own unique place within that history. The exhibition is co-curated by Associate Professor of Art History at Hamilton College Stephen J. Goldberg and Susanna White, former Associate Director and Senior Curator of Collections at the Wellin Museum of Art. 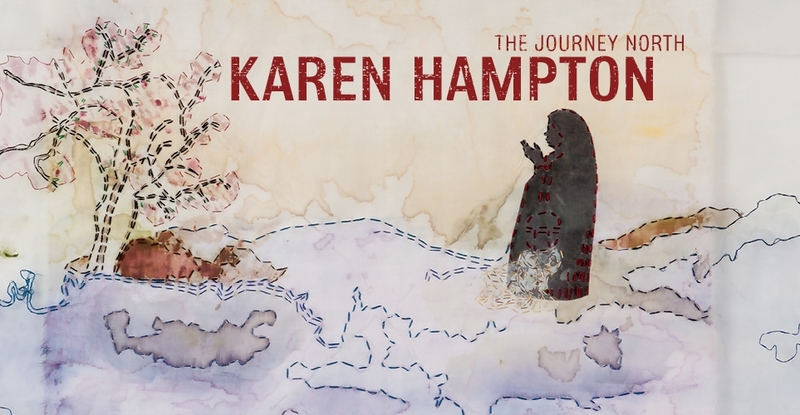 Karen Hampton: The Journey North is organized around several narrative threads that, when woven together, culminate in a complex tapestry of Hampton’s hopes and visions for African-American lives. 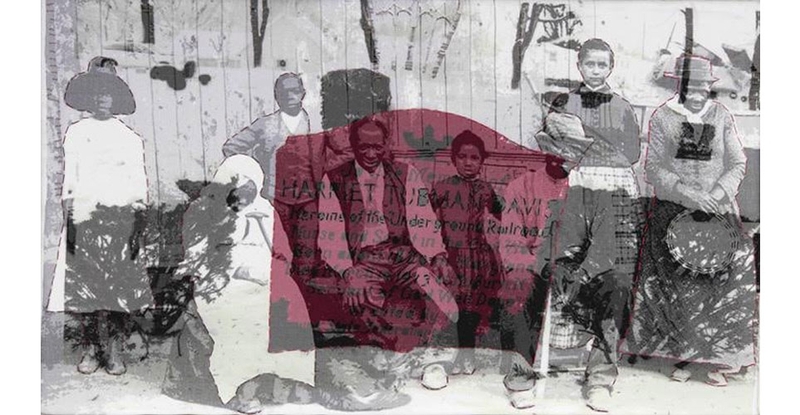 A self-described “griot” (the keeper and transmitter of the genealogies of a people), Hampton uses cloth as her medium to embed references to her genealogical discoveries through stitching, weaving, and digitally printing layered images, inscriptions of voices, and other historical markers. Employing embroidery and weaving, Hampton also hand-stitches her family roots to illustrate their “journey north.” She also incorporates modern techniques that include archival photo transfers and painting to embellish and invent a new style of narrative. Karen Hampton: The Journey North was organized by the Ruth and Elmer Wellin Museum of Art at Hamilton College. More: Read our interview with Hampton on the museum blog. 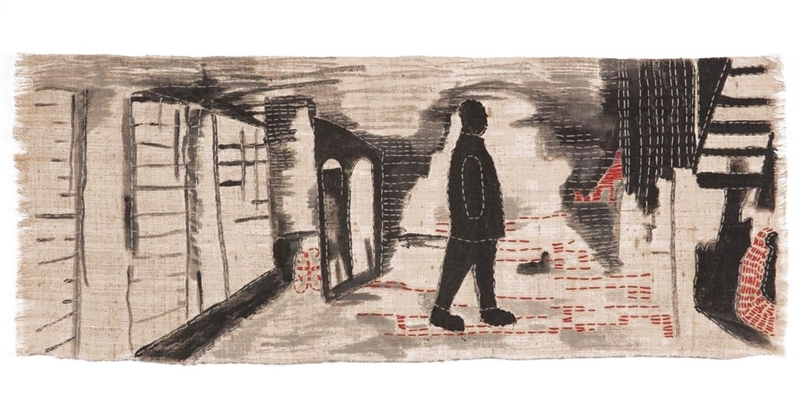 Los Angeles–based artist Karen Hampton uses the art of embroidery, coupled with found textiles and a multitude of textile techniques, to recount her own complex family history and give voice to long-forgotten stories that tell about African-American experience. In this workshop, participants will experience the art of storytelling using a collage of different materials and techniques to tell stories of their family and community. Please bring three pieces of old cloth (clothing, found or collected), embroidery needles and scissors. Karen Hampton’s work has been featured in solo exhibitions at the Museum of Craft and Folk Art (San Francisco, CA); College of Marin (Kentfield, CA); Art Foundry Gallery (Sacramento, CA); Design Gallery, and UC Davis (Davis, CA). Hampton’s work has been part of recent group exhibitions including Innovators & Legions at the Mescogen Art Museum, University of Kentucky, Invisible Lineage at the San Jose Museum of Quilts & Textiles; Breaking Ice: Bay Area Artists Consider the African Diaspora at the SF Artworks Gallery; among others. Hampton is the recipient of the 2014 Sacatar Foundation award, 2008 Eureka Fellowship, 2008 Marin Arts Council Award, and 2000 Ellen Hansen Prize from UC Davis. Hampton received an MFA from the University of California, Davis, and a BA from New College of California, San Francisco. Video: Youth Poets Ariel Pruyser and Malia Derden respond to Karen Hampton: The Journey North.